Since it’s Saturday, also known as TV/Movie day here at tattooed missionary, I decided to share some of my most frequently watched TV shows this month. 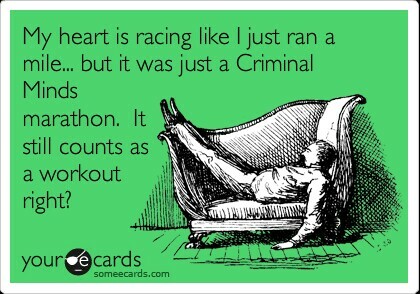 (Yeah… I watch a lot of TV.) I’ve been laying off of movies this year and really hitting TV shows hard. My DVD collection is feeling neglected but my Netflix account is getting a workout. So, here they are! The top seven shows I’ve been into lately, in no particular order. 1. 30 Rock (on Netflix) – A couple of years ago I was hanging out at my friend Joslyn’s house. Carolyn was there too. They said, “Have you ever watched 30 Rock? No?! Oh my gosh, you have to see it!” So they showed me the episode where Liz succumbs to spinsterhood and gets a cat named Emily Dickinson. I wish I could say I was hooked instantly but it’s not true. I was uninterested and unimpressed. Cut to this past Christmas break at my friend Rebecca’s house where she has just finished finals and I had just finished a million hour drive (preceded by one hundred hours on a plane). Rebecca had been watching 30 Rock and asked if I wanted to watch some too. Well, laying on the couch watching anything beat going outside and facing the Alabamian winter (which is kind of a joke actually) so we watched about a season of 30 Rock in two days. That time I was hooked. I’ve since watched the entire series twice. 2. Criminal Minds (on Netflix and Megashare) – Last year I got into Criminal Minds and watched all of the seasons Netflix had to offer (which was most of them). Then I took a break, because I didn’t know where to watch new episodes (I hadn’t yet discovered Hola Unblocker which is a magical tool that tricks popular websites into thinking I’m in the United States or Megashare which is probably illegal). This year I picked it back up again and I’m all caught up. Sometimes I wonder what kind of person enjoys watching people suffer at the hands of psychopaths but I suppose I’m not alone. It’s a pretty popular show, no? One thing I really like about it, and what I think sets it apart from other cop/murderer shows (at least for me), is the emphasis on the team. The 43 minute show manages to pack in enough terrifying and disturbing images to keep you awake for a week AND enough characterization and personal back story to keep you in love with each member of the behavioral analysis unit. 3. 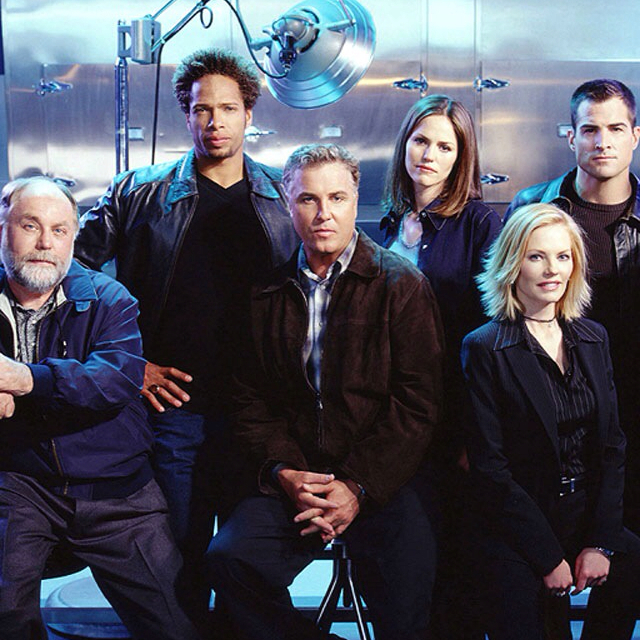 CSI (on cbs.com) – CSI (Las Vegas style, of course) has always been one of my favorite shows and Nick Stokes has always been one of my favorite characters. As in, one of my favorite fictional characters EVER. I adore Nick Stokes. However, even my pretend boyfriend may not be enough to save CSI. After 13 seasons, it might be time to say goodbye. The cast has changed so much and it just gets cornier and cornier. Plus there are only so many ways to kill someone. I miss the good ol’ days of Grissom and Catherine but I’m not willing to say goodbye until Nick does. Which may be soon. This season there have been episodes that don’t feature him at all. I skip those ones. CSI (well, Nick Stokes) will always hold a place in my heart, but Criminal Minds might be taking its place in my crime drama hunky man TV slot. 4. Scrubs (on Netflix) – Scrubs is another silly one like 30 Rock that I got into after its time, which was great because that meant that by the time I was interested I could watch all of the episodes on Netflix! I like to watch shows like 30 Rock and Scrubs during unwinding/no thinking time and also as background noise to by fill-in/Sudoku puzzles. Before I started watching Scrubs I hated the word “frick.” Thanks to Elliott Reid it is now my go-to pain-induced exclamation. 5. New Girl (on Hulu and Netflix) – I got hooked on New Girl last summer and I’m loving keeping up with the gang every week. While I believe I’m in the majority when I say I’m not a huge fan of Coach, I don’t hate him as much as I used to. The characters on this show are just rich. Schmidt says the best things, Nick is hilariously himself, Winston (excuse me, Courtroom Brown) is nuts, and I can relate to Jess (teacher who sings everything and is sometimes irrationally emotional coming through!). Cece is gorgeous and awesome. 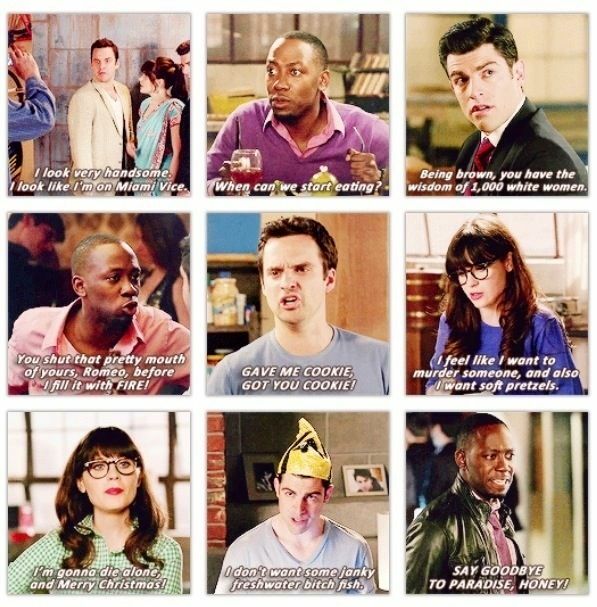 Basically, New Girl is always going to make me laugh and always going to provide great names for my kittens. I’m a little worried about what’s going to happen with Nick and Jess, but I’m having faith that it’s all going to work out in the end. 6. House (on Netflix) – My friend Carolyn (who also initially recommended 30 Rock) let me borrow her six seasons of House during my senior year of college. I watched them all in one semester which, to answer your unasked question, was a little obsessive. I started having weird-o dreams about House. But, enough time has passed so I decided to dive back in. Now I don’t enjoy binge watching because I’ve realized that the same thing happens on every episode. Crazy disease! Diagnosis! The patient almost dies, proving the initial diagnosis (and inevitably, one of the doctors) WRONG. New diagnosis. Happy ending. 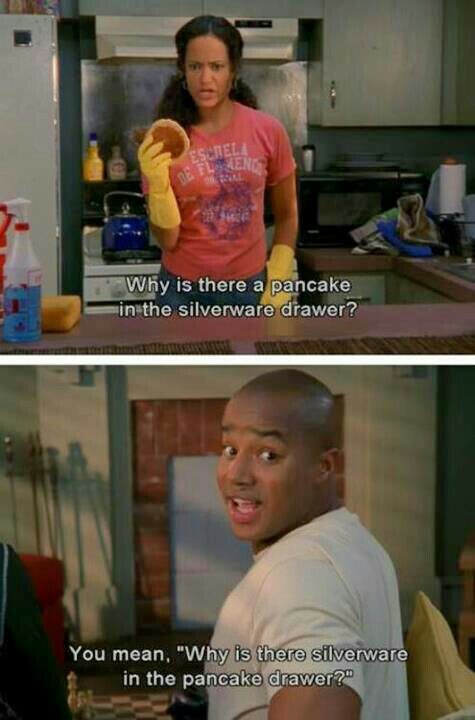 House is a jerk but does something redeeming. I like how he tells it like it is though, even if it’s a little harsh sometimes. Although I have not watched past season seven (and have no desire to do so – House gets too crazy! ), I continue going back to older episodes every now and again. It’s a nice serious one (that’s not about people getting murdered) to throw into the mix. Plus sometimes I have a crush on Chase. 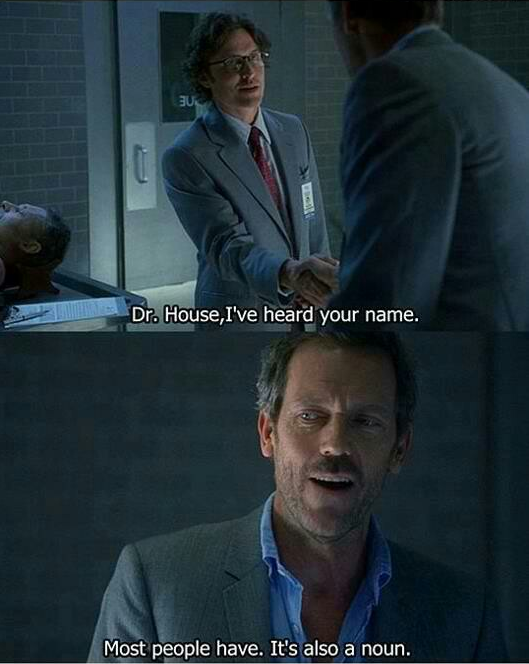 Also I’m totally impressed that Hugh Laurie is actually British and he’s doing House in an accent. 7. 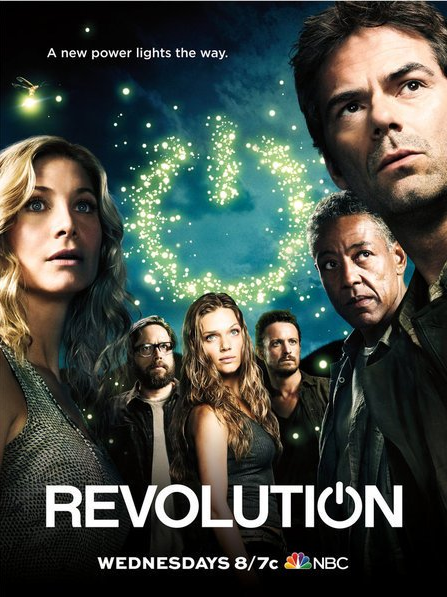 Revolution (on Netflix) – I started this one very recently and I’m really enjoying it. It’s about life in the United States after all electricity and power has been off for fifteen years. The country has split into Republics and the leader of the Monroe Republic is on the search for 12 pendants that could bring the power back on. In the first episode, Charlie, the main character, watches her dad killed by the Militia, who also kidnaps her brother. She sets off on a journey with her kind of step-mother and village teacher to find her uncle, who will help her find her brother. So far (I’m about ten episodes in) they’re managing to carry on the story pretty well, revealing small things along the way, introducing and killing off characters – it’s working! Once I’ve finished the season that’s on Netflix I hope I’ll be able to watch new episodes as they air! .What TV shows have you been into lately? I love New Girl, Scrubs, and 30 Rock! Try Parenthood! It’s a drama, but it’s hilarious! It makes me laugh and makes me cry almost every episode! It just tugs at my heart strings hard for some reason. 4 seasons on Netflix! I used to watch Parenthood, but for some reason I just stopped watching one day. It was at a pretty pivotal moment, too! Jasmine had just left for New York or something. Anyway, one day I should get back into it. Thanks for the suggestion, Sarah! Yay! 30 Rock friends! We watched SO MUCH that weekend. Oh, the Criminal Minds gang! And you’re right – someone had to have at least thought up these psycho ideas. Oh well, at least we know the attractive profilers are on the case! Don’t talk to me about the last episode of New Girl because I haven’t seen it yet! I’m waiting on Hulu. One day we will spend a week watching Netflix together, I trust! It’s so weird that Dominican Netflix gets things you guys don’t! Just another reason to take a trip to the Caribbean.